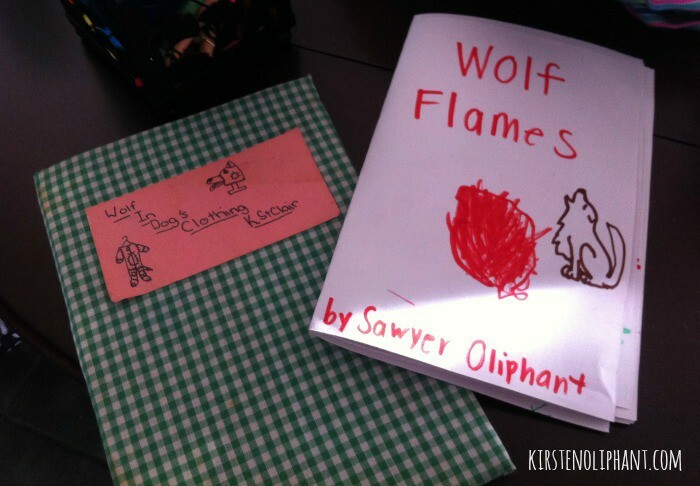 My first short story alongside Sawyer’s similarly inspired first story, written with my help. You know you have one hiding in a box somewhere. Or maybe you burned it long ago…but it haunts you. I’m talking about that piece of writing you toiled and sweated over, the one you loved. For months and maybe years you hammered on the keys or scrawled in notebooks or whatever your process is. It was your baby. You finally finished, feeling accomplished and hopeful. Whether through a series of rejection letters or a harsh critique by reading partners or even your own realization a few months or a year later as you revisit it. In the move, I found boxes full of such babies. I wrote my first novel in third grade in a Hello Kitty notebook with rainbow pages. Each year, I wrote something new. Some finished, some not. All terrible. I can hardly stand to look at these now, and yet I can’t throw them away. I can forgive the terrible because I was so young. I mean, hey—I wrote a novel at age 8. That counts for something, even it’s dreadful. In this fabulous post from Jane Friedman, she says that when you hate your writing, it’s a good sign that you’re on the right track. Come again? The idea (which comes from a YouTube series on storytelling from Ira Glass) is that there is often a gap between your understanding of what is good and your ability to produce it. There may be years of struggle to narrow that gap. The fact that you know there is a gap between where you want to be and where you are tells you that you’re heading the right way. You will get there. I feel a little better knowing that. Because I have produced a lot of crap over the years. A LOT. Much of it I loved until I had some time and looked again, or someone with great eyes looked and gave me a critique that helped me see it with better focus. So if you’re feeling stuck, frustrated, or otherwise like you’re never going to get to where you want to be, let this encourage you to push on. Don’t stop because you realize that your manuscript is not the pretty and polished baby that you hoped it would be. You will get there, one piece of poo bit of writing at a time. Last week, we talked vomit versions and this week, it’s vomit-y final drafts. There is no prompt, so link up any recent blog post of your writing. Let’s keep the community a community: visit all the others. Leave a comment to let them know you were there. If you like what you read, consider sharing the love. If you want more of a connection, join the FB community. Link back to this post either in text, by downloading the photo and linking to it, or snagging the code in my right sidebar and pasting it (while you’re in the “text” or “html” mode of composing). I will be visiting, reading, and sharing in the next week. So glad for every one of you reading and being brave to share your work! I have that Harlequin Romance I wrote back in 10th grade…on an old electric typewriter on onionskin paper. And then I have my MG novel that some ‘great eyes’ looked at and gave me some good advice on, but it still hurts too much to start revising that baby. I don’t think I ever wrote any romances, but I sure wrote a lot of books in junior high about the popular girl I wanted to be. Womp womp. Talk about shallow!! I have so many of those stories piled around, files on the computer that are gathering pixelated dust…It’s hard not to look back and grimace, but you are right in the fact that we should feel pride at accomplishing what we did at such young ages. I definitely don’t want to throw them out…but that doesn’t mean I want them shared, either. 🙂 But young writers rock! 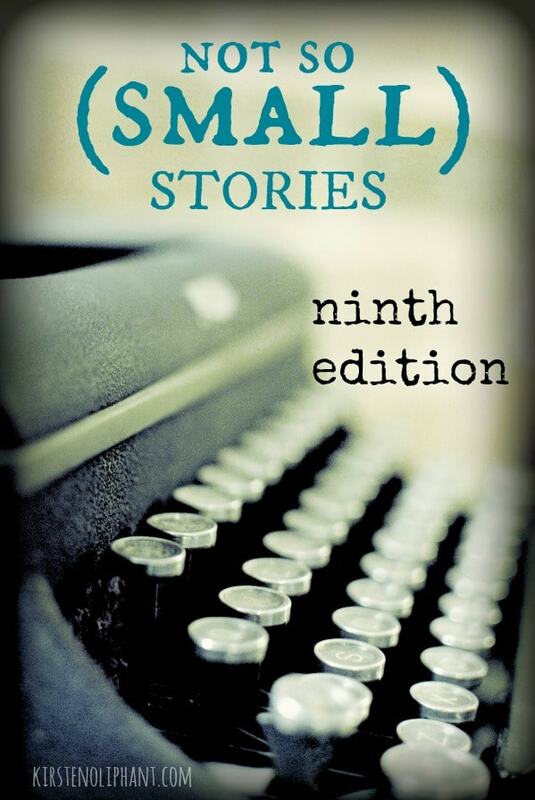 I started writing short stories when I was ten. I’ve always struggled with dialogue, and hope someday to counter that anxiety. Right now I’m just happy that I’m satisfied writing shorter mobile blogs. It’s been a real challenge for me. My father is on his fourth book and I’m now realizing it takes so much practice. I am reading his final draft on the plane ride home. Thanks as always for the blogspiration.